fact: there’s rarely a need for dessert. yet, a good meal wouldn’t be complete with a sweet touch at the end. and yup, i always have room for sweets. so i told my friend: “you know, i’m not a racist when it comes to dessert. i love all sweets equally”. and that was that. sweets are the world’s spice. 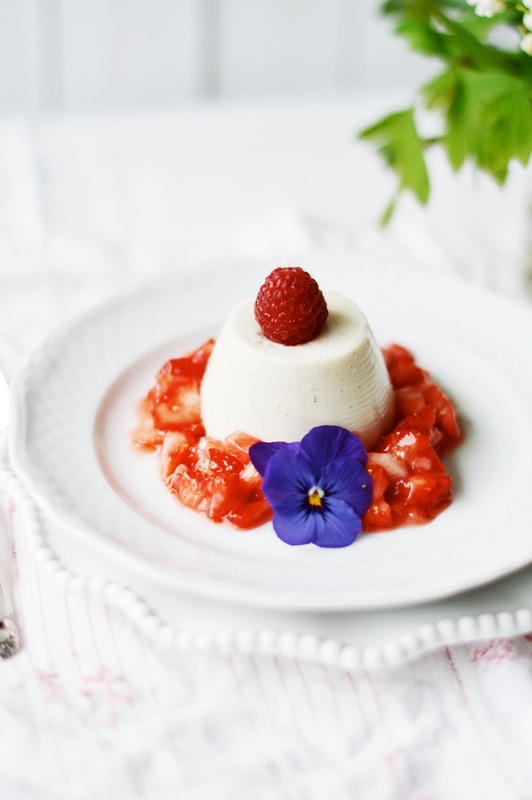 now pannacotta… i think it’s wonderful. but it’s often on the heavy side indeed. so, beacause i like the light, silky texture of almond milk, i thought why not make this vegan instead? a good finale to a lavish menu – or simply a nice treat inbetweet. almost refreshing (as far as desserts go). start ahead by making the almond milk: soak the almonds in the water and refridgerate overnight. the next day, put the almonds and water in a blender or food processor and pulse until the almonds are very smooth. strain through a fine meshed sieve or through a cheese cloth. collect the milk. 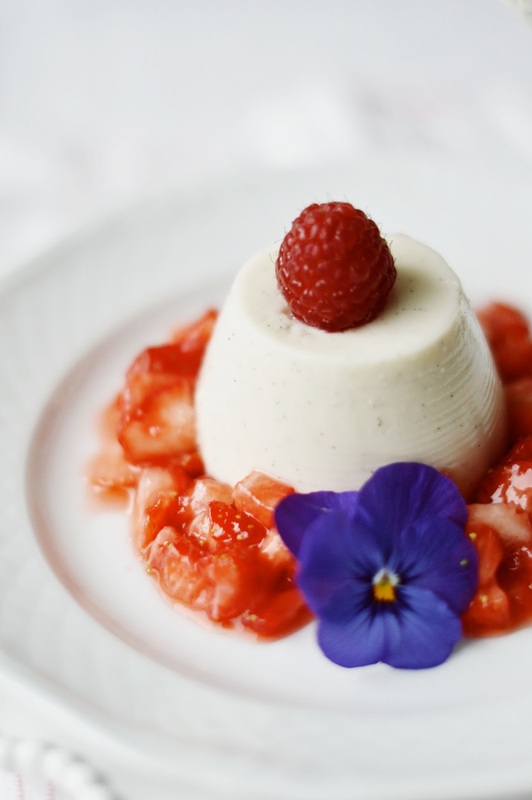 now for the pannacotta, heat the almond milk together with the sugar, vanilla bean and tonka bean. bring to a boil, then reduce the heat. dissolve the agar agar with some water, then pour it into the hot but not boiling almond milk. pour into custard ramekins. let cool in the fridge for at least 4 hours. in the meantime, dice the strawberries and marinate them with the syrup and lemon juice. let sit for a while. when the pannacotta is cool and firm. run a knife along the ramekin’s borders, then turn over. 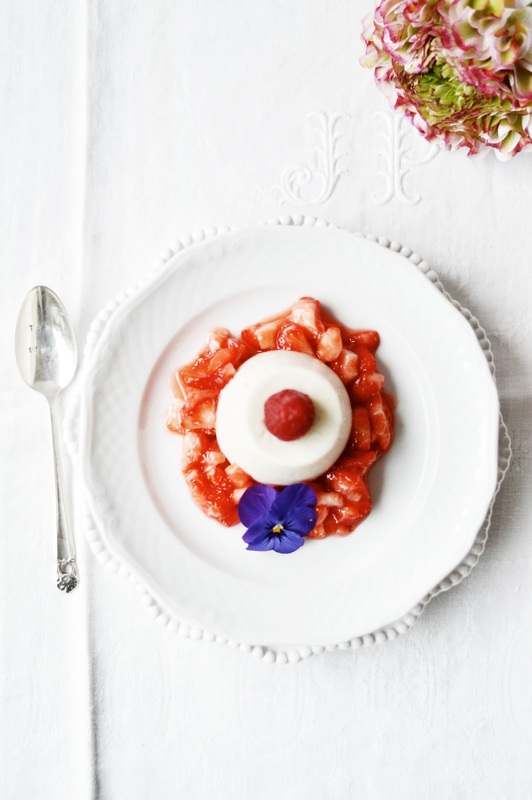 place the pannacotta on a plate, then garnish with the strawberry salad.